154 Hidden Court: Identity confirmed. Pretty much everything I do is on the computer now. I get all my information online. But of course as with every fabulous thing, there's usually one major drawback, and in this particular instance, it's the dreaded username/password/security question trifecta of evil. I'm a "member" of roughly 5.8 million internet sites, all of which have different requirements. I can barely remember where I left my car keys (In the car. In the ignition. In the garage, in case you wondered) so remembering the usernames and passwords for a million obscure internet sites is laughable at best. I assume I'm not the only one. Can I get a "hell yeah?" So some brilliant website designer or another (or maybe a whole TEAM of designers - or maybe a whole CONVENTION of designers) came up with the idea of security questions. They way when you forget your password (which you will, what with its uppercase/lowercase/number/special character/goat hair/blood sacrifice combination) you can simple answer one of the previously chosen security questions that of course you will always know the answers to. Ahem. Then there's this site I ran across the other day. In addition to the normal "grandma's name" questions, there were some other doozies on the list. For example, What's your least favorite food? I'm not entirely sure how to answer that. The short answer is "seafood", but that's a pretty broad category. So maybe I would answer "fish" or "crab" or "shrimp" or whatever, depending on my mood that day. What was the name of your first stuffed animal? was another question that threw my for a loop. Uh, Bear, maybe? I have no freaking clue, and I'd be amazed if many other people did either. How old were you when you got your first computer? What? I don't know. Does a word processor count as a computer? And do you mean a computer-computer, and do you mean MY VERY OWN, or a shared one? I need more information if you expect me to answer these questions. What was your first gaming console? Really? It had Pac-Man on it. That's all I know. I'd also like to take this opportunity to point out that this was not a gaming related site, so that question just seems... odd at best. What's your lucky number? Hmmm... whatever number I need to pick to win the lottery will be my lucky number. I'm taking suggestions. What's your favorite activity? Oh, reading of course! Or maybe running. Or possibly writing. Wait! Is sleeping considered an activity, even though you're not actually active? Where did you go on your first holiday? Well, I was born in the middle of January, so my first holiday was Valentine's Day, and I don't think I went anywhere. Oh wait. Do you mean holiday like vacation? Like I'm British or something? Oh, well then, I've never gone on a British holiday. See how hard this is? What is your favorite cousin's first name? I have a blue million cousins. What are the chances one of them might see my answer and wonder why he/she isn't the favorite? Better skip that one. What color was your first pet? Um, is "imaginary" considered a color? How old were you when you got your first gaming console? Enough with the gaming console business already! Does anyone ever remember stuff like that? What's your dream job? Ok, here's one I can answer! 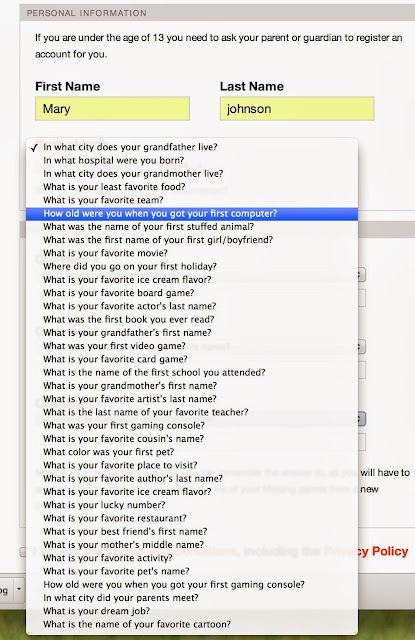 My dream job is making up ridiculous security questions for internet sites. I'm going right now to fill out an application. I remember having a game console way back in the day, but I couldn't tell you what it was. Atari? I can't remember last Tuesday, let alone something from the 80s. I'd never make it in password-ville. Those are some pretty out there questions! My answer would be Atari. For all of them! Sadly, coming up with weird security questions is what they were doing instead of something important like systems testing. I like the sites that let you write your own security question - though I usually just make the question a hint reminding me what the password is and the answer is the password. Because this is not something I'm going to use more creativity on. Yes! On the ones that let you write your own, my question is usually "THE ANSWER IS BLUE" because I chose "blue" as the answer, but then I spend a really long time typing in words like "smurfs" because I forgot that I was so straightforward with it.